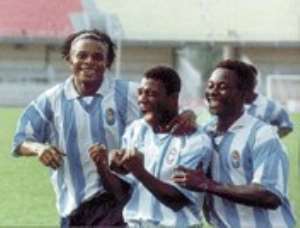 Accra, May 7, GNA-Accra Great Olympics will on Sunday host 2003 League Champions, Kumasi Asante Kotoko in a special May 9 Memorial Match billed for the Accra Sports Stadium. The friendly which will climax activities marking the third anniversary of the May 9 Accra Sports Stadium Tragedy will see the sides meeting for the first time this year. Both teams have undergone series of transformations, notably the changes in the composition of their technical teams and are expected to renew the arch rivalry that had always characterized their games. Whilst Kotoko won their last friendly game against Feyenoord by a lone goal at the Kumasi Sports Stadium on Wednesday, the "Wonder Boys" played a barren game against Liberty Professionals in Accra to set the stage for an uncompromising duel on Sunday. Like Kotoko's Hans Dieter Schmit who desperately needs the win to keep his boys focused for their continental campaign scheduled for Sunday, May 16, Olympics' Mohammed Polo will be hoping to inject confidence in the returning fans ahead of the commencement of the season by winning against the champions.